According to research, we found that approximately 2000 people died monthly due to the only carelessness of their health. This is because they don‟t have time for themselves and forget about their health management due to a heavy workload. The reason behind to make this project is the growing world of technology and people forget their health checkup which is needed to be done monthly or quarterly. As we all know that internet of things make our life easier. So, we have decided to make an internet of things based healthcare project for people who provide them all the personal information about their health on their mobile and they can check their all historical health data. The best part of this project is that it can be used by everyone and make our health management easier than available systems. Android applications help a person to access the piece of information anytime anywhere in the mobile only and it is easy to carry a mobile. It will save a lot of money of user which is going to be spent on curing of any disease, by giving early warning of health disorder. The IOT Based Health Care System for the Elderly is cheapest healthcare device based on the IOT platform for the patients and doctors. It provides a solution for measurement of body parameters like ECG, Temperature, Moisture, and Heartbeat. It also detects the body condition and location of the patients. The mobile application for the patient and doctors contain a very simple GUI Interface for reading all the parameters in the mobile or at anywhere in the world by using internet connectivity. In this project we are using various sensors and modules for performing a different type of functions and the „Thingspeak‟ Cloud service is used for storing all the data in the cloud, it provides security and facility of accessing all the parameters at any time which is very useful for the doctors at the time of treatment. This system also generates an alert when it required that means at the time of any critical conditions and notifications about the medicines, location change, conditions etc. 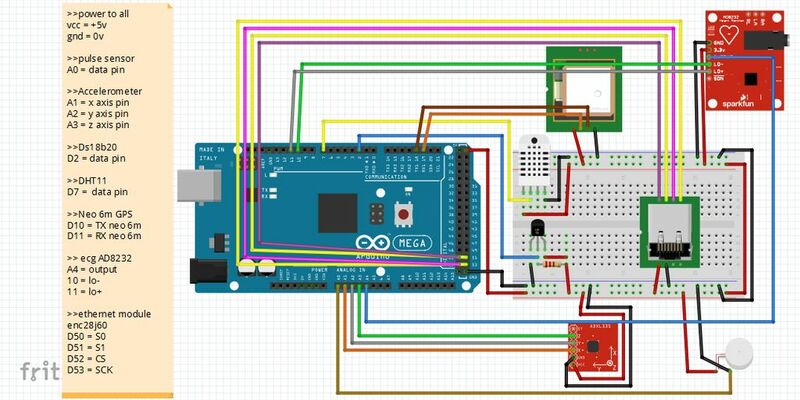 We have connected all the sensors and Modules as Given in this Schematic Diagram. volatile int IBI = 600; // int that holds the time interval between beats! volatile boolean QS = false;  // becomes true when Arduoino finds a beat. //  pieces of information in a channel. Here, we write to field 1. //  ThingSpeak will only accept updates every 15 seconds.